OSHA’s bloodborne pathogens standard requires that employers establish a written Exposure Control Plan if they have any employee(s) with occupational exposure. 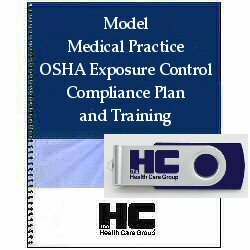 HCG's Model Medical Practice OSHA Exposure Control Compliance Plan is designed to guide and assist practices in their compliance efforts; it includes regulations with which employers with occupational exposure to employees must follow as well as necessary charts and forms. As of August 2015, our new and improved Exposure Control Plan exceeds the requirements of OSHA’s bloodborne pathogens standard by including important information about airborne pathogens and preventing the spread of airborne illnesses. It includes information that will remind your staff of respiratory and coughing etiquette, which will promote a safe, healthy worth environment as well as help eliminate the transmission of illnesses such as the flu. Also included with the Plan is an Exposure Control Training (on a USB flash drive) for training your staff and meeting your annual and new employee bloodborne pathogens standard education requirements. This Training Module also contains a post-test and answer key to assist your practice in ensuring that employees understand occupational exposure and their responsibilities under the practice’s Exposure Control Plan.